Tokyo Rebel: Innocent World reserve and special order info! We will shortly be posting an Innocent World reserve page on our own site. The process itself will be very similar to the one we use for Baby, the Stars Shine Bright, so for now you may read through the process and rules on BTSSB's reserve page on our site if you would like to place a reserve order for an Innocent World item. 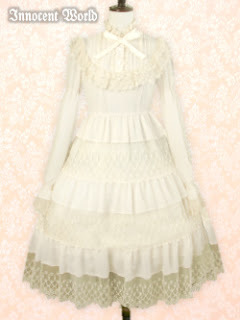 (You can see a list of items available for reservation on Innocent World's site here.) As with Baby, all reserve orders must be initiated through email. We will not be posting reserve products directly to our site for ordering as we do with Victorian maiden. Lastly, our next store order will also be with Innocent World, so now is the time to get your special orders in for any in-stock items they have as well! We will be ordering a selection of their products for our store, but if there is a particular item that you want, feel free to inquire about it by email. Please let us know in your email whether you would like store pickup or to have your item shipped, and if so, to where. We will quote you a total price. (Note that we cannot exactly match IW's own discounts on sale items.) We do require 100% pre-payment for special orders. The deadline for your initial inquiries is Sunday the 18th. We will be finalizing our store order soon after.